“How to improve gender equality in the workplace” reached Google’s top five searches around gender equality in the last year. Interest in women’s rights is at an all-time high: this is a powerful moment to drive for change. Women have tremendous potential to transform our economies, societies and businesses. Research from Citi shows that reducing gender inequalities in the workplace over the next two decades could add around 6% to GDP in advanced economies. That makes empowering women in the workplace both a priority issue of rights and a powerful economic lever. But we are not there yet. UN Women’s latest report Turning Promises into Action shows that just 63% of women aged 25–54 participate in the labor force, compared to 94% for men in the same age bracket, and that on average women continue to earn 23% less than men. Meanwhile, women do about three times more unpaid care and domestic work than men, including school runs or caring for elderly relatives. This unfairly constrains women’s options and, in addition to limiting their earning and career opportunities, can prevent them from studying, taking care of their health and taking on leadership activities. Unshared care responsibilities also affect where women work; contributing to the segregation of women into the more flexible but low-paying, low-value jobs and keeping them in positions of less authority. Private sector leaders have a key role to play in addressing these issues and ensuring that their workplaces offer equal opportunities and fair treatment to both women and men. One crucial aspect of this is zero tolerance for abuse and harassment. As more and more women step up publicly and say “me too”, the world is beginning to recognize the scale of sexual harassment and other forms of violence across our societies and in our workplaces, and to recognize that power has for too long brought impunity. The reports emerging through social media and other channels underline the impact of women’s cumulative voice to change that dynamic, and bring accountability and change. Violence in all its forms takes an unacceptable toll of women and their livelihoods. Studies have found that women who are survivors of violence are likely to miss work due to injuries and earn up to 70% less than non-abused women. It is time to end this. UN Women has longstanding work on empowering women in the workplace; from the thought leadership of flagship reports, like our 2015 Progress of the World’s Women on making economies work for women, to practical resources, like our online platform, EmpowerWomen.org ,which allows women to share evidence, experiences and good practices on economic empowerment and is a useful resource for employees and business leaders. And the Women’s Empowerment Principles (WEPs), created in partnership with the UN Global Compact, offer companies concrete guidance on empowering women in the workplace, marketplace and community. How Can We Step It Up? Involving men is a vital part of this. It is important that we work together to deconstruct negative social norms and rebalance the power structures that fuel violence and inequality. This is the crux of UN Women’s HeforShe movement, and since 2015 HeForShe Corporate IMPACT Champions have taken creative and effective approaches to tackling the greatest barriers for women in the workplace. For example, in 2016 PwC dramatically increased the number of women on their Global Leadership Team, from 18% in 2015 to 50% in 2017, while AccorHotels are driving towards gender parity in management and equal pay. And as the Inaugural HeForShe Thematic Champion for Paid Parental Leave, Danone has committed to implement a 1,000-day parental leave policy, providing 18 weeks of gender-neutral paid parental leave in more than 130 countries. These are the kinds of game-changing initiatives that can create immediate and tangible change in the workplace for women and their families. As the engine for jobs, innovation and investment, business has a critical role to play in advancing gender equality and empowering women to reach their full potential. It’s time to rev that engine up. We know what makes a difference to women at work: access to decent jobs, with equal pay and opportunities; active mentoring and sponsorship programmes; promoting women’s entrepreneurship; greater flexibility in remote working; and provisions such as health and child care, parental leave and pension schemes. Now, we need others to join in and take concrete actions to ensure women’s economic empowerment and a more equal workplace for all employees and staff. 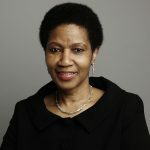 Phumzile Mlambo-Ngcuka, UN Under-Secretary-General and Executive Director of UN Women since August 2013, served as Deputy President of South Africa from 2005-2008, before which she held Ministerial positions and was a Member of Parliament. Focusing on human rights, equality and social justice, she began as a teacher, gaining international experience at the World YWCA. She founded the non-profit Umlambo Foundation.